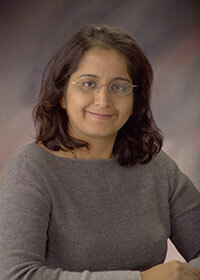 Dr. Namita Ahuja began her medical training in her native country of India. She came to the US in 1995 and started her Internal Medicine Residency at Methodist Hospital of Memphis. She was Chief Resident for one year following her completion of her residency. She developed an interest for Geriatric Medicine during her residency. After completing her fellowship this year, she has joined the Division of Geriatrics and currently sees patients in a clinic at Canterbury nursing home.